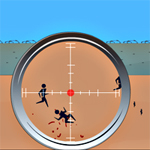 Jail Sniper info about the game-Games2Rule. Your mission is to kill the terrorist in order to complete the mission. Gun down all the terrorist attempting to escape from the jail. Your sniper will become active once you zoom in the sniper lens. This should provide you with adequate coverage against terrorist. You have to kill assigned number of terrorist to move to further mission. Good luck!